Welcome to the only repairer in East Auckland that is dedicated to the independent service and repair of BMW cars exclusively. We don’t repair any other brand of car. Conveniently located in Grey Lynn (near the intersection of Great North Rd and Bond St), we are committed to friendly service, quality and value. Our technicians have extensive experience working on BMW cars and have the latest diagnostic computer equipment, as well as comprehensive brand specific tooling and information resources. All of our workshop equipment is tailored to the repair of BMW & MINI vehicles. Quality tyres for your BMW and MINI at competitive prices. We are open from 7.30am to 5.30pm Monday to Friday, courtesy cars available (all BMW with automatic transmissions), Mandarin speaking staff. 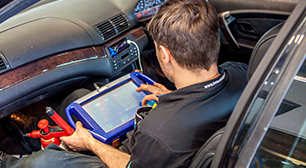 Specialized computer diagnostic equipment and comprehensive information resources allow us to fix your BMW first time, every time - cost- effectively. If your BMW or Mini is due for Service, has warning lights on or has problems other service centers are unable to fix then contact us now. Service, Diagnostic, Brakes, Suspension, Tyres, Wheel alignment - we can take care of all your requirements.